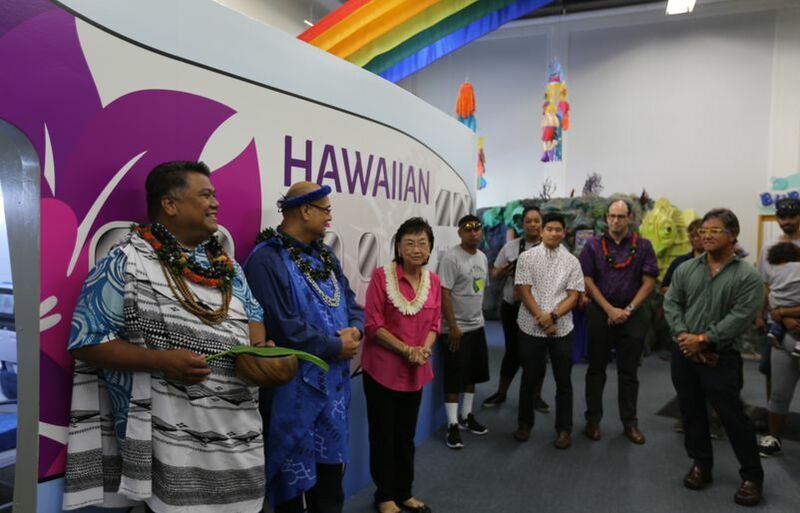 Hawaiian Airlines is transporting youth to greater heights with the unveiling of our revitalized aircraft exhibit at the Hawai‘i Children’s Discovery Center (HCDC) in Honolulu’s Kaka‘ako neighborhood. Local and visiting keiki can experience the magic of aviation and its unique role in our community. The interactive exhibit includes real Airbus A330 aircraft components and video displays to simulate the flight experience – like virtual take-offs and landings from the pilot’s cockpit. 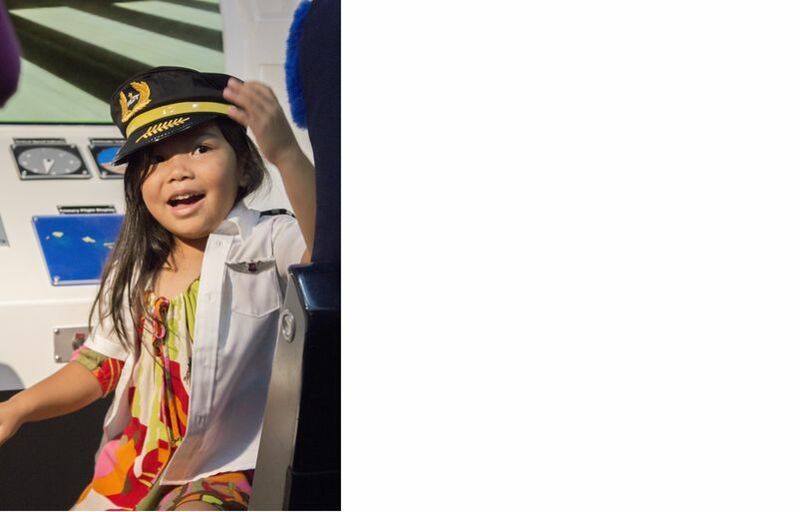 Children can role-play in Sig Zane-designed airline uniforms and imagine themselves working and flying aboard a Hawaiian Airlines aircraft. 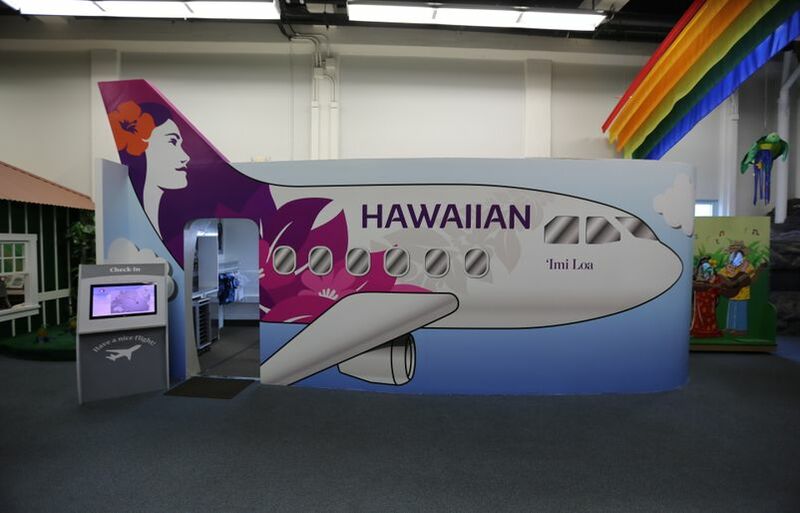 Originally launched in 2013, the exhibit underwent major renovations to reflect the company’s recent brand enhancements to its Pulani (Flower of the Sky) icon, aircraft livery, and employee uniforms. To mark the exhibit’s re-opening earlier this month, a Hawaiian blessing was conducted in the same way we welcome all new aircraft that enter service – with a traditional oli (Hawaiian chant) and untying of the maile lei. 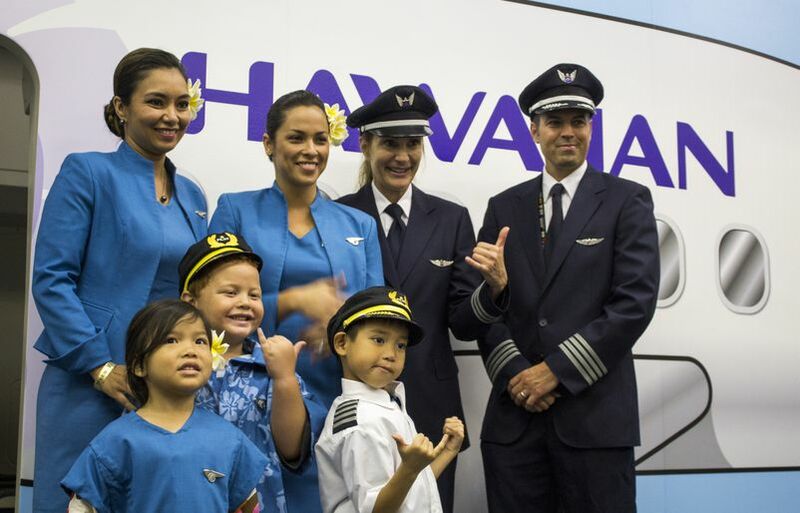 Children from the Hawaiian Airlines ‘ohana and Kapa‘alana Family Education program were the first to experience the new exhibit. The project would not have been possible without amazing volunteers from our maintenance and engineering team, who contributed over 620 hours over 26 days to complete the upgrades, which included replacing the previous display’s design mirroring our narrow-body Boeing B717 with an updated version of our wide-body A330 – the aircraft that flies Hawaiian’s long-haul routes. 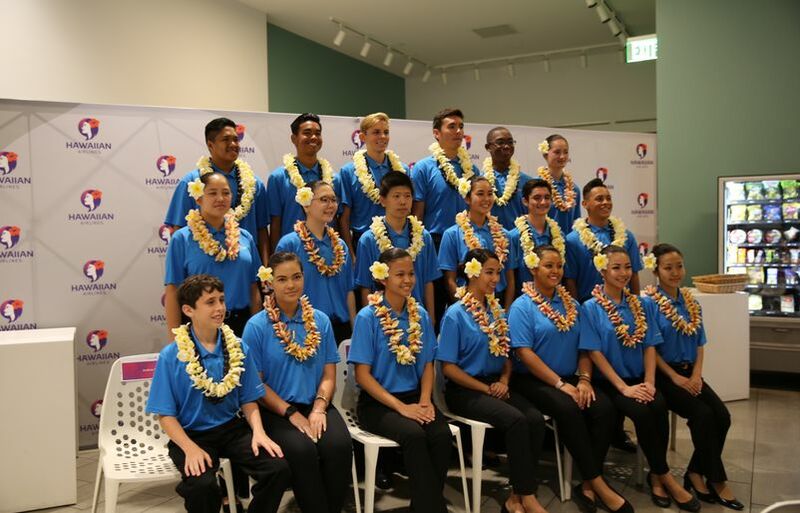 Ka Ho‘okele “The Navigator” Explorers Program, developed with the Aloha Council Boy Scouts, features more than 20 Hawaiian Airlines employees from diverse sectors of the company who volunteer to mentor high school students in aviation careers. Hawaiian’s Aircraft Mechanic Apprenticeship Program (AMAP), in partnership with the University of Hawai‘i at Honolulu Community College’s Aeronautics Maintenance Technology program, provides valuable on-the-job experience for up to eight candidates as they work toward obtaining their Airframe & Powerplant (A&P) license, a FAA certification. 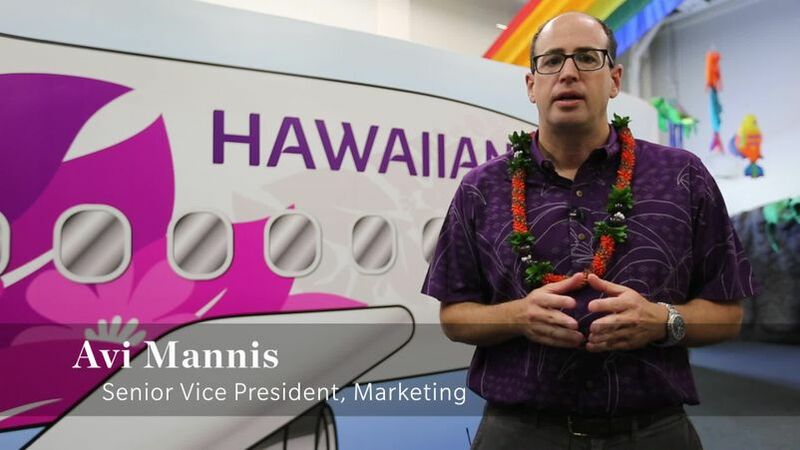 For more than a decade, Hawaiian has conducted popular Keiki Tours for preschool and elementary students at Honolulu’s Daniel K. Inouye International Airport. In 2016, the Hawaiian Airlines Foundation donated $50,000 to Maryknoll School’s new high school Mx Scholar Program for STEM (Science, Technology, Engineering and Math) & Aerospace. Whether you’re on vacation on O‘ahu or planning your weekend ahead, your ‘ohana can experience our new exhibit by visiting HCDC. For the museum’s hours and ticket information, please visit http://www.discoverycenterhawaii.org/.